Be the first to share your favorite memory, photo or story of Arthur "Jim". This memorial page is dedicated for family, friends and future generations to celebrate the life of their loved one. Arthur J. 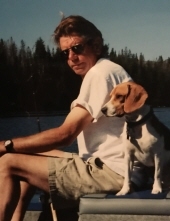 “Jim” Vuylsteke Warwick, 66, a former resident of the McMinnville community, late of Forest Grove, died Friday afternoon, February 1, 2019 at the Willamette Valley Medical Center in McMinnville, Oregon. A Celebration of Life will be held Sunday, February 17, 2019 at 2 pm at Prime Time Restaurant, 4450 Pacific Ave, Forest Grove. Private Burial Rites to be held at Forest View Cemetery, 1161 W Pacific Avenue in Forest Grove. ARTHUR JAMES VUYLSTEKE WARWICK was born November 21, 1952 in Hillsboro, Oregon, the son of the late Cyril Arthur Vuylsteke and Jacqueline Anna (Lewton) Vuylsteke. He was raised and received his education in several communities including Forest Grove, Rhododendron, Government Camp and Eugene, Oregon, until 1961 when they moved to California, settling in Saratoga. In 1967, they returned to McMinnville, Oregon where he was a graduate of the McMinnville High School Class of 1971. Jim worked in the construction industry for forty years. He had worked for several concrete companies, the majority of time with Burch Concrete in McMinnville. He resided in the McMinnville community for many years, until 2009, when he moved to Forest Grove, to be near his aunt and uncle. There, Jim worked in the agriculture industry with his uncle and cousin for ten years. Among his special interests he enjoyed fishing, crabbing and hunting. With his buddies he enjoyed the annual hunt west of Carlton, Oregon in the Trask. Jim was preceded in death by his parents, Cyril Vuylsteke and Jacqueline (Vuylsteke) Warwick. Survivors include his daughter and son-in-law, Jacqueline “Jackie” and Paul Francik of Richland, Washington; his sister and brother-in-law, Nancy and Gary Myers, of McMinnville, Oregon; his aunt and uncle, Nancy Bridges and Joe Heesacker, of Forest Grove, Oregon. Also surviving are his granddaughters, Meera and Eliana Francik, of Richland, Washington, his niece and her husband, Shannon and John Trunde, of Amity, Oregon, their children, Alexandria and Matthew and his half siblings Mike Chritton, Sandra Foley and Mark Vuylsteke. The family suggests that remembrances be contributions to the American Lung Association, 1200 NW Naito Parkway #220, Portland, OR 97209, in his memory. To send flowers or a remembrance gift to the family of Arthur "Jim" James Warwick, please visit our Tribute Store. "Email Address" would like to share the life celebration of Arthur "Jim" James Warwick. Click on the "link" to go to share a favorite memory or leave a condolence message for the family.